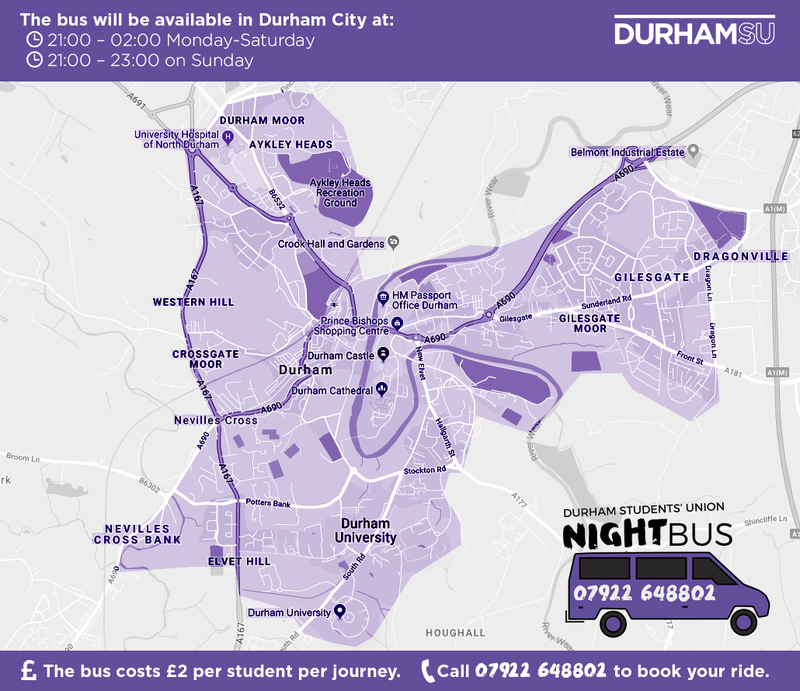 Durham SU operates the Nightbus service in Durham City every night throughout term, providing a safe and secure way for lone students to get home in the evening. There’s no fixed timetable and, just like a taxi service, you can arrange to be picked up by calling the driver on 07922 648802. You can see the areas which the Nightbus operates above, but you may still be able to use the Nightbus even if you're outside the highlighted area. Priority is always given to lone travellers, so please mention this when booking if it applies to you. Due to limited space on the Nightbus, at busy times the driver may be unable to carry large groups of students or there may be a wait before the service is available for larger groups. If you are drunk the driver can refuse to allow you on to the Nightbus, and his decision is final. If you are sick in the bus due to intoxication there is a fee of £50 payable, to pay for the cost of cleaning the bus. Your campus card will be taken as ID and will be retained until this fee is paid. Your college will also be told about the incident. If you vandalise or otherwise damage the bus, you will be charged a fee for repairing the bus. Your campus card will be taken as ID and will be retained until this fee is paid. Your college will also be told about the incident. Verbal or physical abuse will not be tolerated on the Nightbus. If you are verbally or physically abusive towards the driver or other passengers, you will be ejected from the bus and your college will be told about the incident. You may also be subject to the University’s disciplinary procedure as a result – you can find out about the University’s Respect at Work and Study policy here.